Although roses are soft and fragile, the rose bush is resilient and adjusts to almost any environment without requiring much maintenance. However, if you live in harsh conditions like those found in Arizona State, you need to keep a few pointers in mind when you trim your bushes. Trim your roses between mid December and mid January, which is the ideal time if you live in Arizona. Not all roses need trimming. If you have shrub roses, floribunda’s, hybrid teas, or grandiflora roses, trim them back to knee height. You may cut off up to ¾ of the bush’s height. Wait until the blooming cycle has ended and temperatures have dropped below 70 degrees. If you have some bushes that are still blooming after January, hold off from trimming them, but don’t wait any later than February 15. Cut back once blooming bushes right after they bloom. Generally this is around late spring and the first part of summer. It isn’t necessary to trim back climbing roses. Do a light trim after September 15. Trim off only approximately ¼ of the rose bush. Slightly angle your cuts approximately ¼ above any bud eyes growing outward. Leave only a few strong stems. Discontinue feeding your roses 1 month before the first average freeze in Arizona. To maintain your roses in the summer, water your rose bushes, and don’t feed them. Provide afternoon shade. In the spring, water your roes, feed them, spray pesticide and treat for mildew. 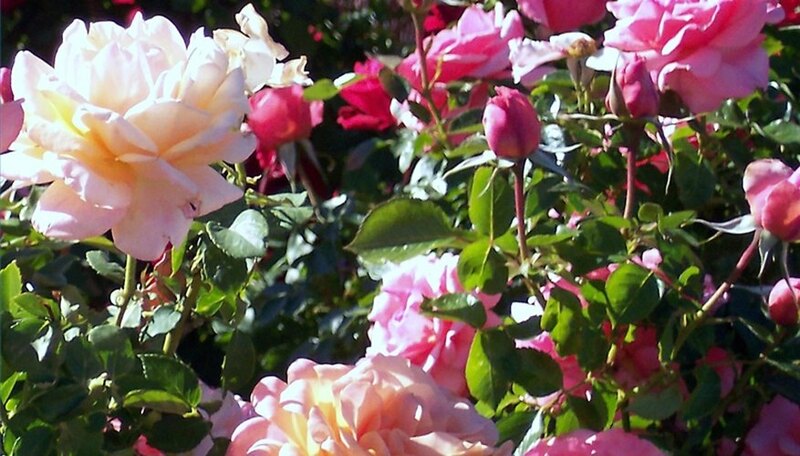 When Should I Prune Roses in Arizona?